Aberdeen Proving Ground, Md. (Dec. 9, 2015) -- In today's cellular world, communicating coast to coast is a given. But for Soldiers deployed around the world, many in austere locations with no established commercial network, it isn't so routine. So when Soldiers on the west coast recently communicated with their peers who were nearly 3,000 miles away on the east coast using the Army's Manpack Radio and the Navy's Mobile User Objective System (MUOS) waveform, the mission to keep troops connected took a significant step forward. Working together, the Navy and Army are delivering the MUOS capability, which provides users across Joint Services with secure voice and data on demand, similar to commercial 3-G cellular service. The Navy's Communications Satellite Program Office has overall responsibility to deliver the MUOS capability (satellite and ground stations), and the Army's Project Manager for Tactical Radios will supply the Manpack Radio, which will initially be the primary radio used with MUOS. Using the MUOS waveform, troops all over the world can talk, text and share mission data seamlessly. 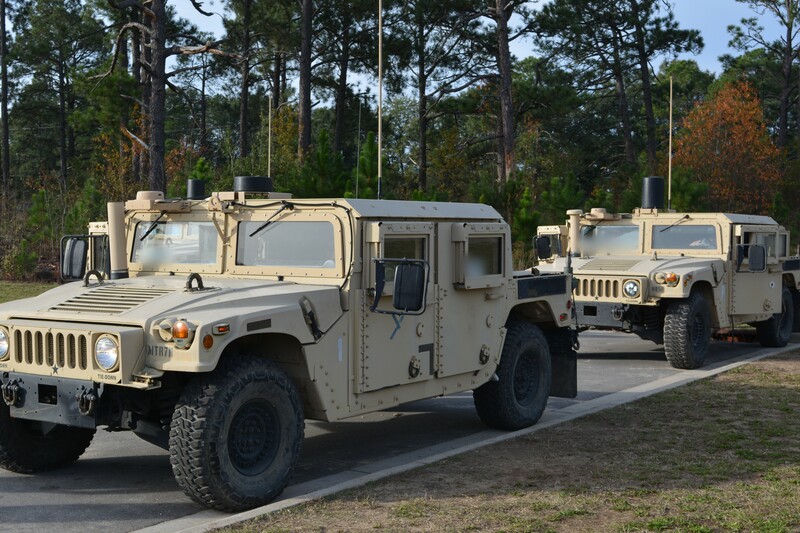 "The MUOS waveform provides a beyond-line-of-sight capability, which allows Soldiers to be anywhere in battle and maintain connectivity," said COL James P. Ross, project manager for Tactical Radios. "In addition to infinite range, Soldiers can exchange large amounts of data using the Manpack Radio and MUOS waveform." The demonstration was part of an Army conducted Customer Test (CT) with the Manpack Radio running terrestrial waveforms -- the Soldier Radio Waveform (SRW) and the Single Channel Ground and Airborne Radio System (SINCGARS) waveform -- simultaneously with the MUOS waveform. The demonstration, paired with operational tests, will help determine if the MUOS waveform is ready for operational use across the Services. One of the key features of the two-channel Manpack Radio is its ability to run different waveforms, including advanced and current force waveforms, on each channel. For instance, the Manpack Radio can run the SRW or SINCGARS on one channel and run the MUOS Beyond Line-Of-Site (BLOS) waveform on the other channel, allowing units that are BLOS of each other to connect seamlessly, increasing combat effectiveness of the overall system. The Manpack internally bridges the voice and data of the two waveforms to enable the interconnectivity of the BLOS SINCGARS or SRW networks. "This was the first successful demonstration of the SINCGARS to SATCOM cross banding," said LTC Rayfus Gary, product manager for Handheld, Manpack and Small Form Fit (HMS). "We had dismounted Soldiers using SATCOM on the move with MUOS and bridging to SINCGARS, which is a huge capability in tactical operations." 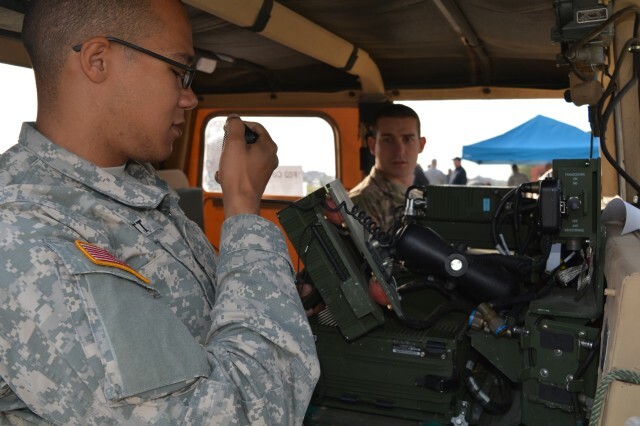 With Soldiers from the 3rd Brigade, 82nd Airborne Division serving as operators and test data collectors during the CT, the Manpack Radio was tested in both mounted and dismounted configurations in various terrains with the MUOS waveform. The terrains included urban areas, densely wooded and open spaces. The CT also tested a new prototype low-profile Vehicle On The Move (VOTM) antenna. "The low-profile antenna isn't as tall as the so-called 'top hat' antenna, which is the current program-of-record VOTM antenna," said Steve Stout, HMS chief engineer. "The Soldiers didn't like that the top hat is so tall, and that it may get in the way of other items also on the vehicle, such as a gun turret, so we are seeing how well the low profile antenna performs. The low-profile VOTM is about one fourth the height of the 'top-hat' VOTM." While one of the biggest challenges during the CT was the diverse terrain, the MUOS omni-directional antenna, which Soldiers carried in their rucksacks, enabled on-the-move communication without having to stop and point the antenna toward a satellite. This is a key advantage of MUOS over legacy TACSAT. "We didn't experience any problems in the field -- we went around trees and in ditches and hills, and the radio kept the connection," said Private First Class Michael Handley. Leveraging 3G Wideband Code Division Multiple Access (WCDMA) cellular telephone technology, the MUOS system uses geosynchronous satellites with ground stations to provide military users with secure voice and Internet Protocol (IP) data connectivity. Information travels via UHF WCDMA to one of the MUOS satellites, then Ka-band down to a ground station. From there it can be routed to another ground station via terrestrial fiber, then it is uplinked back to the same or different MUOS satellite via Ka-band communications, and then back down via UHF to another user anywhere in the world. Even though the routing seems complex, information is delivered quickly, with messages traveling nearly 100,000 miles a little less than a second and a half. Soldiers communicated between three locations -- Joint Base Lewis-McChord, Wash.; Fort Bragg, N.C.; and Fort Drum, N.Y. -- in a variety of mission scenarios and vignettes. "Just as I am talking to you, we communicated with our peers in Ft. Lewis and Ft. Drum," said Specialist Bradley Lewis. "MUOS negates all obstacles." 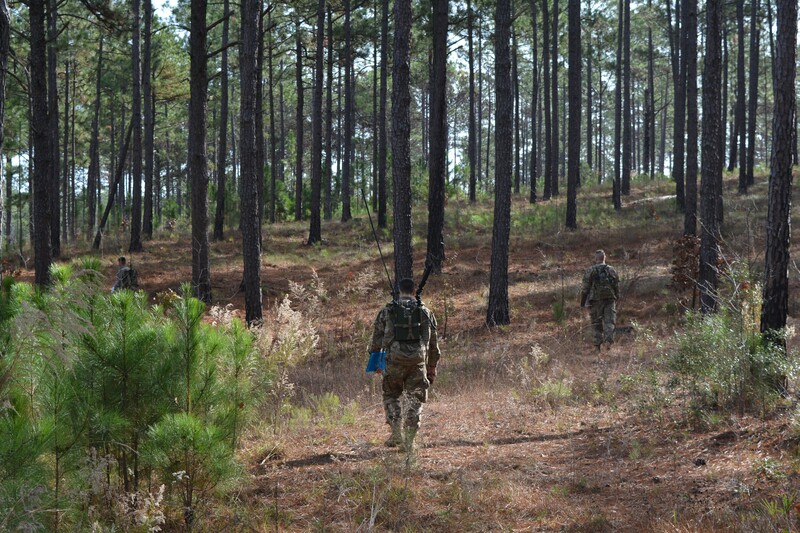 During the CT and other operational tests, each site evaluated the Manpack Radio running the MUOS waveform with Soldiers at the Pause (SATP), Soldiers on the Move (SOTM) and in VOTM in various types of terrain including urban, open and densely wooded areas. Ft. Lewis, serving as the overall test control location, acted as higher headquarters for all three sites, with calls being routed through two ground stations -- Wahiawa, Hawaii and Chesapeake, Virginia -- using two satellites (MUOS-1 Pacific and MUOS-2 CONUS). There are two other ground stations in Italy and Australia and two more satellites that round out the MUOS network. The fifth and final satellite, which will be a backup in case one of the other satellites goes down, will be launched in May 2016, and will be located within a few degrees of the nearby MUOS-4 satellite. In order to ensure the MUOS waveform can run on the standard Manpack Radio, the Army developed the MUOS High Power Amplifier (MHPA), which replaces one of the Manpack Radio's standard amplifiers. The MHPA will eventually become part of the radio itself. While Low Rate Initial Production Manpack Radios are already being fielded to Soldiers in Iraq and Afghanistan, and are used for training, the Army plans to procure an additional 60,000 Manpack Radios. A Request for Proposals was released on August 3 for full rate production, and contract awards are expected during summer 2016. The Army will conduct Phase II of the CT this month at the Electronic Proving Ground, in Fort Huachuca, Ariz., to collect additional performance data on the Manpack Radio using the MUOS waveform in conjunction with the other legacy waveforms.